USA - North East Connecticut, Maine, Massachusetts, New Hampshire, New York, Rhode Island, Vermont. All over the world, Japanese vehicles have made their mark on the automotive & motorcycle industry. 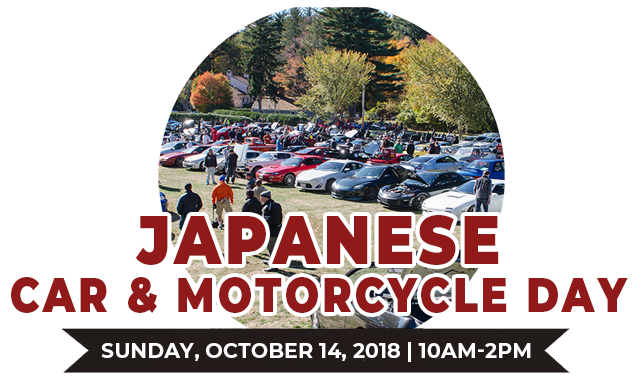 Cars and Motorcycles from the Land of the Rising Sun often don’t get as much respect as some of their Western counterparts, but Japanese Day is a celebration of Japan’s important role in the story of the car & motorcycle. Come check out one of the most diverse gatherings of automobiles at the Museum! From tuners and customs to well-preserved classics, there is plenty of variety at this event. Event Details: The show starts at 10am and runs until 2pm. Car registration is $20 per car and includes the driver and one passenger and $25 day of. Motorcycle Registration is $15. Spectator admission is Adults, $10. Military, seniors, students and children 6-12, $5 and children under 6 are free. Museum Members are always free! The Museum is open for your viewing until 4pm.